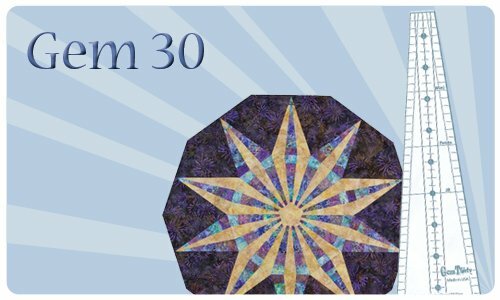 The Jewel Box Gem 30 is a great addition to the Jewel Box family. 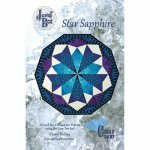 Three Gem 30 pieces sewn together makes a Gem 10. 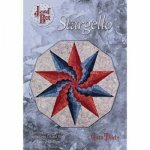 When you substitute a three pieced Gem 10 in the existing designs you add a whole different flavor to your projects. 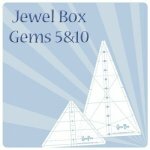 You can also divide the Gem 5 into six sections. 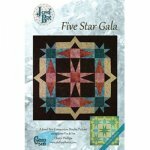 The Bonus pattern, sample shown below uses simple strip sets of 2 1/2" strips cut into wedges sewn to one piece Gem 30 wedges. Surprisingly simple project for a final project with the illusion of complexity. In other words, it looks like you've worked harder than you really had to! 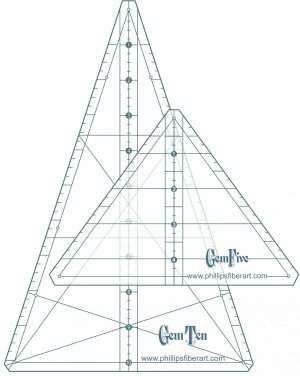 The project includes a template for the background pieces, although using a Gem 10 Tool makes it much easier. As it's name implies it takes thirty pieces to complete a "circle". 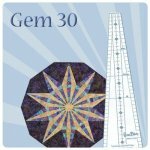 The Gem 30 makes lovely projects by itself as well.